Finding the right set of Airplay speakers has never been such difficult in a time of shops bursting with various goods. Here we compiled the top 3 best Airplay speakers that offer unmatchable sound quality with stylish designs, and teach you how to choose best Airplay speakers for Apple TV and other Airplay devices. There are so many different types and styles of Airplay speakers. 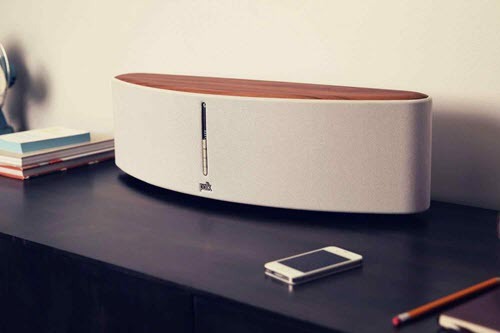 By and large, to find the best Airplay speakers to stream audio and music, you should consider a few key indicators, including sound quality, design, connectivity, etc. Sound quality is the most important element to make the best Airplay speakers for Apple TV and other Airplay devices. In short, great sound performance depends on a large range of frequencies and high signal-to-noise ratio. The low-frequency response produce a heavy bass notes, while the higher frequencies will keep sounds crystal clear. If you want to maintain a balanced, undistorted sound, look for the Airplay speakers that have low, medium and high frequency drivers. Besides, it's to be noted that the higher signal-to-noise ratio the Airplay speaker has, the clearer sound it produces. Things with good looking are always more attractive. Thus, finding the right look for your Airplay speakers can be just as important as the way they sound. So far, best Airplay speakers for Apple TV, iPhone, iPad mainly feature streamline or ring shape. You can decide the most stylish Airplay speakers according to personal preference, but remember: never sacrifice style for performance. Generally, Airplay speakers works only if there is Wi-Fi connection. However, best Airplay speakers for Apple TV and Airplay-enable devices can do more. They often offer an auxiliary output. For example, you are allowed to buy a simple cord for about $10, use a USB cable, or switch to Bluetooth if your Wi-Fi is on the fritz. Never think of there's a free Airplay speaker for Apple TV? All you need is 5KPlayer - the best Airplay speaker software to Airplay audio music to Apple TV without costing a dime! Or you can also use it to directly stream audio music to physical Airplay-enabled speakers you bought as well. All the airplay speakers we review are based on sound performance, design, connectivity, and price. 5KPlayer is a free software Airplay speaker for Apple TV, iPhone, iPad, Mac and PC. It enables you to stream video music from iOS to computer and Mac/PC to Apple TV with enhanced audio quality. If you have not made up your mind to spend real money on a physical wireless speaker, do not shilly-shally anymore and download 5KPalyer right now. Never miss the true and genuine Airplay speaker. Note: You cost could be $149.99 instead of 199.99 if you have Amazon.com Rewards Visa. 5KPlayer deserves the winner of best Airplay speakers for Apple TV, iPhone, iPad, iPod, Mac and PC for its profession, versatility and cost performance. On top of a wireless speaker, 5KPlayer is also a HD video player which supports playing 1080p, 4k and 8k videos in MKV, AVI, MP4, etc. Moreover, it excels at video music download from YouTube, Facebook, Dailymotion, and 300+online sites, which will never let you down. AirPlay without Apple TV is feasible as long as you follow this guide with 3 methods to AirPlay mirroring and stream video music to Mac PC HDTV without the need of Apple TV. To make sure you spend the wise money on the most cost-effective and cogent AirPlay devices, take a look at this. Top 3 AirPlay audio receivers 2016 review. Take a look at this review to find out which Wi-Fi audio receiver suits you most!